This house is situated in a side street on the Via di Nola, which has only been partly excavated and which is named after the house. The house itself is well known for the refined third style decorations, considered to be superior to those found in Rome. The juxtaposition of shiny black walls with interposed yellow bands depicting arabesques and hunting scenes, and the black floor with inlaid pieces of marble is particularly unusual. The decorations in the tablinum are worth close examination and depict landscapes with villas and gardens as well as two mythological paintings. The wall to the left illustrates the marriage of Venus ands Mars while to the right we can see the Triumph of Bacchus accompanied by Ariadne on a carriage drawn by oxen. In the yellow room to the right of the tablinum, in addition to a group of cupids, a painting with Narcissus looking at his reflection in the water (on the left) and Perona breastfeeding her old father, Myconis (on the right). 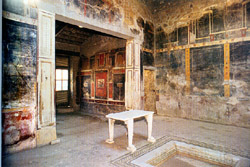 In the centre of the left wall in the winter triclinium (immediately after the vestibulum) there is an illustration of a scene taken from Euripides’ tragedy “Andromache”, in which Neottoleus is killed by the sword of Orestes on the altar of Apollo. In the next cubiculum there is a ‘triumph’ of extremely small and intricate details set against a black background, while on the right wall there is a painting of Ariadne bringing Theseus the thread so that he can find his way through the labyrinth. The house extends out towards the back garden, whose walls used to be covered in frescoes depicting hunts for wild beasts and other animals.